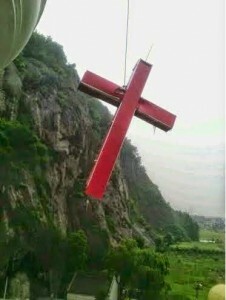 ZHEJIANG, China (China Aid) — As a result of an ongoing “beautification” campaign across China’s coastal Zhejiang province, four more church crosses were demolished by authorities on Thursday and Friday of last week. Dajing Christian Church and Bailuyu Christian Church both lost their crosses on Thursday evening, and two other crosses, those of Dongyu Church and Baiqiangdi Church, were demolished the next day. Church members of a fifth church, Nange Church, reported receiving a demolition notice for their cross as well. According to the members of these churches, the many of the demolitions occurred very late at night or early in the morning, when it was least likely that the churches would have people present to resist. One anonymous member said that their church fended off a demolition attempt earlier in the evening at 9 p.m., only to have authorities return at midnight and complete the job.